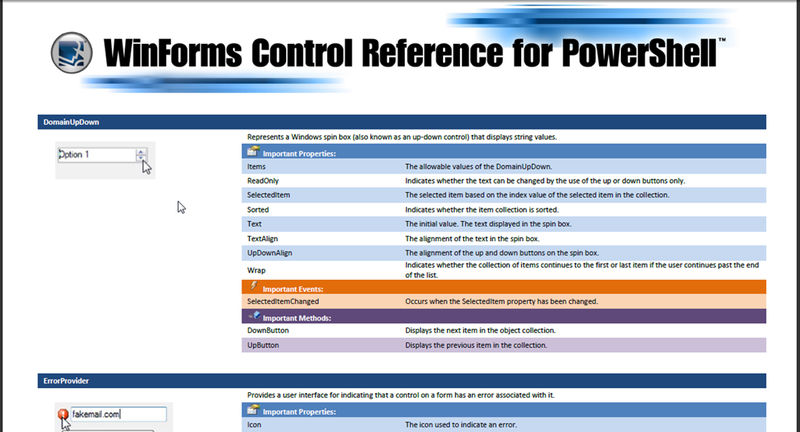 We are happy to release the “WinForms Control Reference for PowerShell” guide. This guide provides you with a quick reference for the WinForm controls in PowerShell Studio. The document contains a list of all the important properties, methods, and events that you should be familiar with when creating GUIs in PowerShell. How can I get the reference guide? The guide will be included in the next service release of the SAPIEN Document Explorer (installed with PowerShell Studio). In addition, you will be able to access the guide directly from PowerShell Studio (v3.0.8 or greater) by clicking on the “Control Reference” button located in the Help tab of the Ribbon. You can also download the Reference Guide directly from our Downloads section under Quick Guides. For more in depth information on individual controls, please refer to our Spotlight on Controls blog series.